Pool: Yes, an outdoor pool. In-room internet access: The hotel also offers free wireless internet access in each room. Parking garage: No garage, but free parking available in parking lot. Standards room amenities: Remote-controlled cable TV, hair dryer, air conditioning, iron and ironing board, alarm/radio clock, telephone. Hotel amenities: GSafety deposit boxes, laundry and maid service, wake-up calls. 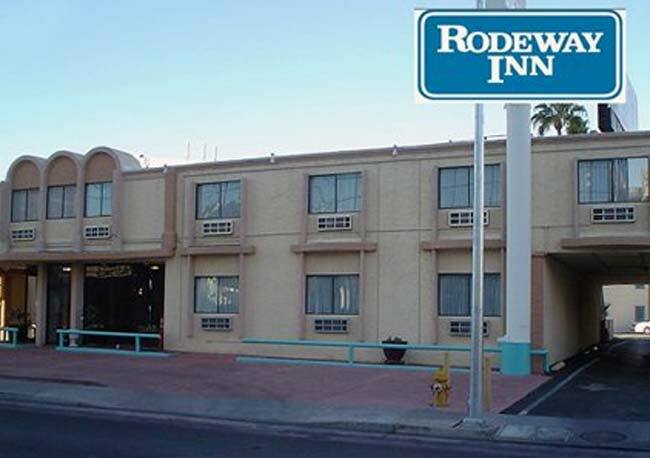 The Rodeway Motel in Las Vegas, Nev., is an economically priced property located within one block of the Strip and the Las Vegas Convention Center. Adventuredome and Star Trek: The Experience are one-half mile away, and McCarran International Airport is less than four miles from the property. The two-story Rodeway Motel's 80 guestrooms feature cable television and complimentary high-speed Internet access, and refrigerators are available in select units. Bathrooms include granite showers and vanities. The front desk is open 24 hours. Parking is complimentary. Amenity highlights: A seasonal pool with sundeck, airport transportation for an additional fee and 24-hour front desk services. 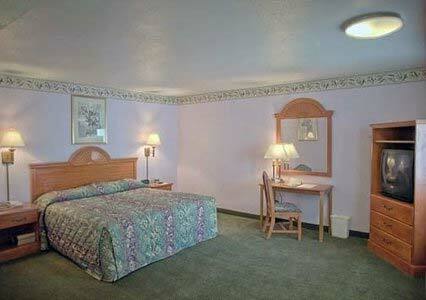 Guests can utilize high-speed Internet access in public areas and the motel's meeting room and fax services. Complimentary amenities include on-site parking, coffee in the lobby and local telephone calls. Several dining options are available in the surrounding area. Dining: Nearby restaurants include Peppermill, Stardust Hotel, Riviera Hotel Piero's, Riviera & Stardust Casino Buffets, Riviera Casino Food Court, and Denny's. The Fireside Lounge at the Peppermill. Voted one of the “…places to see” by Casino Magazine, Best Cocktail Waitress’ by Las Vegas Magazine, Best Exotic Drinks and Most Romantic Bar by Menu Magazine. Featured insuch films as “Casino” and ”Showgirls” and seen on TV in “CSI Las Vegas” and “Elimidate.” Las Vegas’ original ultra lounge, The Fireside lounge has a vibe that must be experienced. The Peppermill Coffee Shop – Voted Best of Las Vegas year after year. 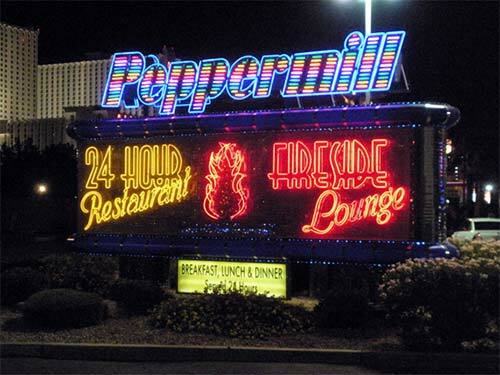 Centrally located on “The Strip,” the Peppermill is a great location for breakfast, lunch, dinner, weddings and parties. Serving generous portions of your favorite food for over 30 years. 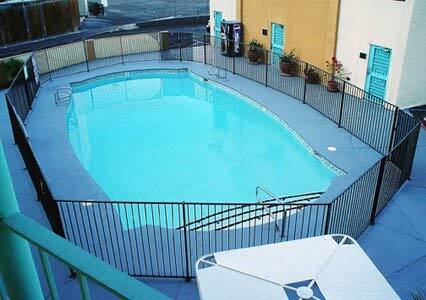 For relaxation, the Rodeway Inn also boasts a large pool open seasonaly. 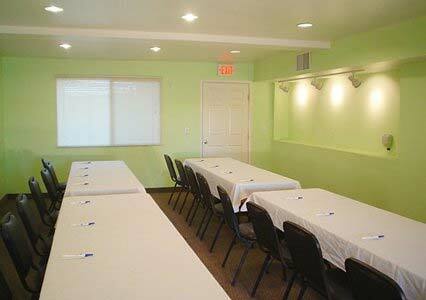 Plan your small meeting at the Rodeway Inn's meeting room accommodating up to 25 people. 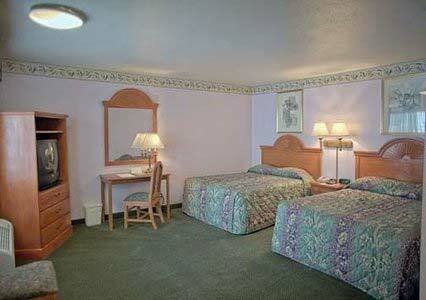 Two queen beds or one king bed in a 320 square foot room with a full granite shower and vanity. When you are not out enjoying the Las Vegas attractions you have Cable TV with HBO. Free local and 800 access calls. Complimentary wireless Internet access. Hair dryer. Iron/ironing board.